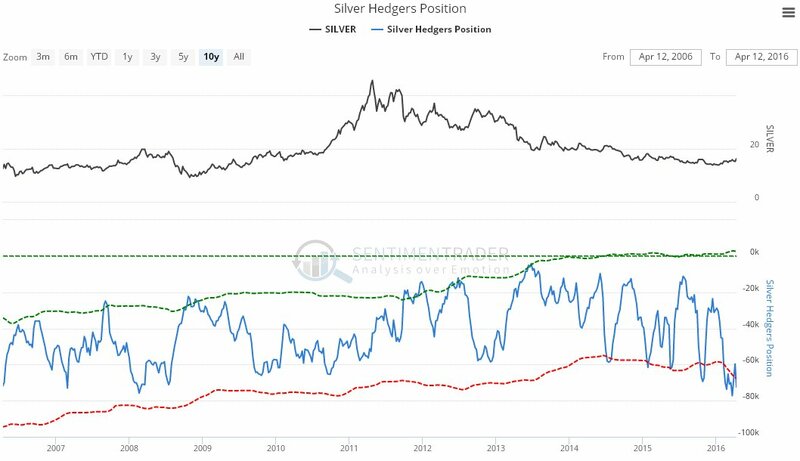 The combination of silver having arrived at a short-term target, with bearish looking candlesticks appearing, gold completing a Head-and-Shoulders top and latest COTs for both gold and silver being at the sort of extreme readings characteristic of a top, all point to silver reversing to the downside here. On its 6-month chart we can see how silver’s sharp advance over the past week or so has brought it up to a trend channel target, where the advance has run into trouble, with bearish looking candlesticks in recent days suggesting that it will soon drop away again. 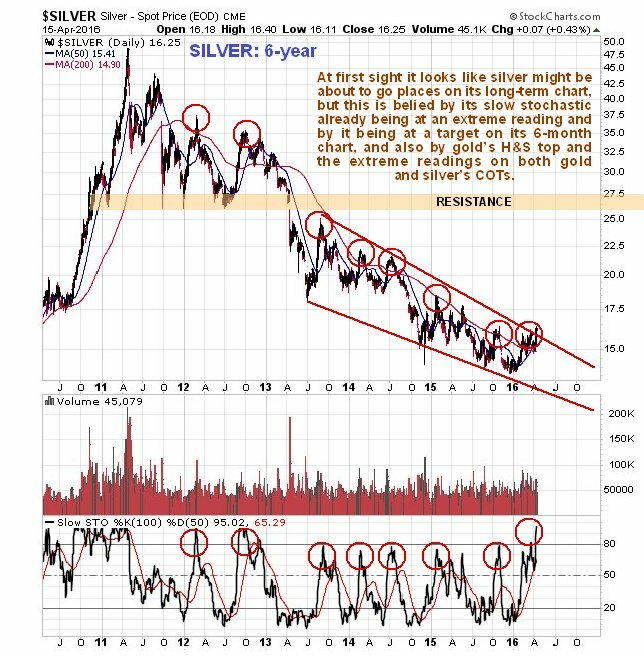 Silver actually looks quite promising on its 6-year chart, as it appears to be on the point of breaking out of its long-term downtrend. However, this is belied by the various factors mentioned above and by the slow stochastic shown on this chart, which is at an extreme reading only attained twice in the past 4 years, and both those occasions were tops. So it looks set to slump back into its downtrend. 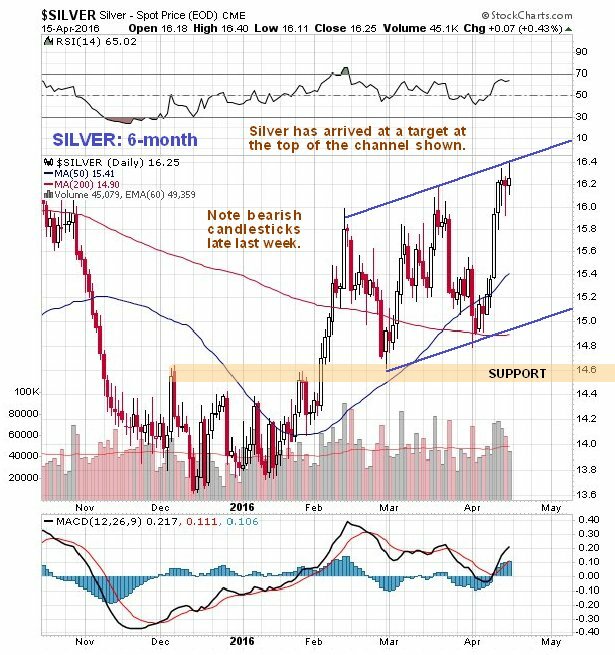 After easing last week, related to silver dropping back to the lower boundary of its channel shown on its 6-month chart, Commercial short and Large Spec long positions ramped up again this week close to recent very high readings due to silver advancing sharply back to the top of its channel. Like gold, these readings are construed as meaning that silver is probably at a top here. Click on chart to popup larger clearer version. 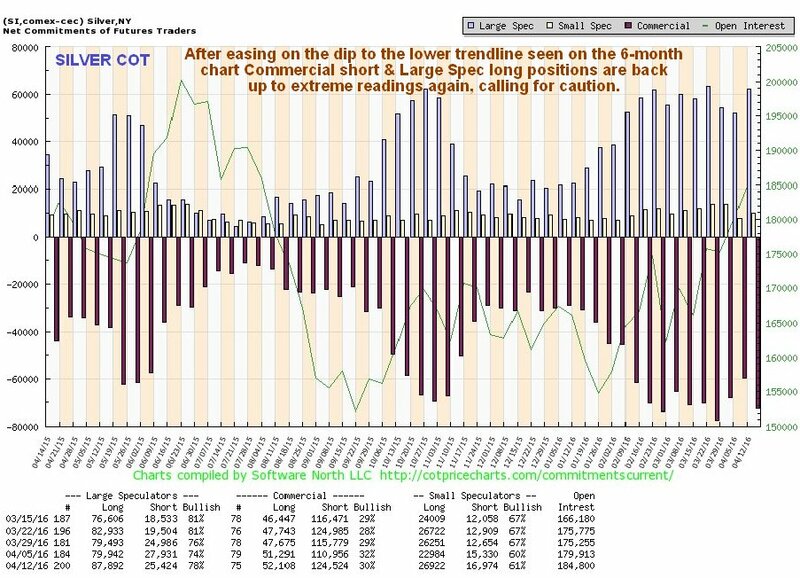 The silver Hedger’s chart, which is a form of COT chart, goes back much further, and reveals that readings are at their most extreme since 2008, after which silver plunged in tandem with the broad market crash – and there are signs that the broad stockmarket may be on the verge of another severe decline, which is something we will look at in detail in a separate report. This chart is viewed as providing a serious warning, which the majority will ignore, of course. Conclusion: despite PM stocks enjoying a mean reversion rally on the back of recent dollar weakness, silver has been a “damp squib” so far this year, hardly rallying at all, and instead of playing catchup as many are anticipating, it looks set to slump back into its downtrend as gold and the stockmarket fall, and the dollar rallies.